ASCO Sintering Co. wins a 2018 Highly Commended award from EPMA for a copper-infiltrated steel latch bolt for a commercial door lock assembly. 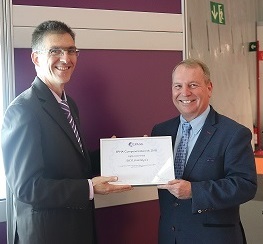 Paul Edwards, European Sales Manager, ASCO Sintering Co., California, USA accepted a Highly Commended Award in the PM Structural Category of the EPMA Powder Metallurgy Component Awards 2018 Competition. The EPMA award was given for a copper-infiltrated steel latch bolt for a commercial door lock assembly. 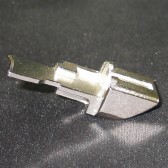 The part is an outstanding example of a PM lock hardware application, unique in that it is not made of stainless steel nor fabricated through MIM. In fact, this part is an example of conventional PM technology stepping into the design realm of MIM technology. This results in reduced costs without compromising strength or precision and quality control performance of five sigma or greater. Making this part as a single net shape PM part saves 60% over other manufacturing methods. The latch bolt is used in a commercial security system and production runs are over 750,000 parts per year. Paul accepted the 2018 award at the EuroPM 2018 Congress & Exhibition Plenary Session in Bilbao, Spain on Monday October 15th 2018. ASCO consistently wins such awards domestically, having won over 35 international MPIF Design Excellence Part of the year awards since 1969. This is the first European design excellence recognition for ASCO Sintering Co.
Paul Edwards' telephone is +44 7770 977895 and he can be contacted via email at pedwards@ascosintering.com or submit a Request for Quote.